One word: cows. 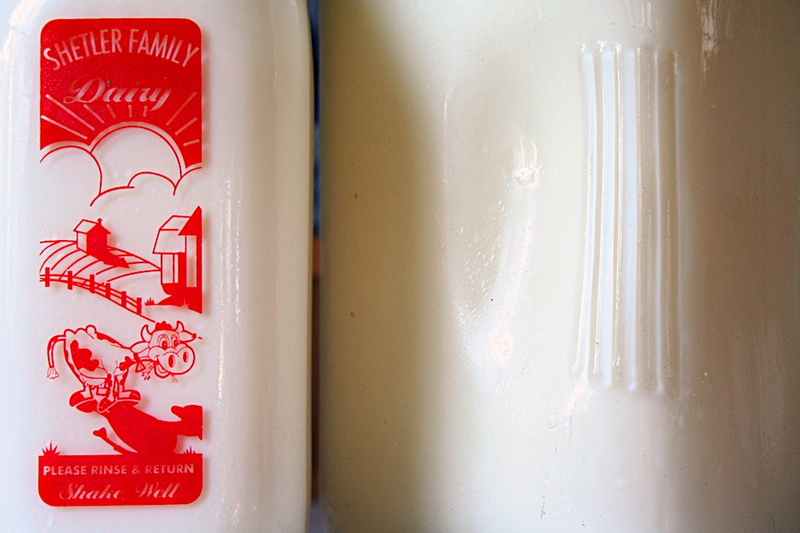 See that cute little cow on the milk bottle? I’ve been to the dairy and met that cow. I even let her lick me. Okay, maybe not that cow, but a cow. So I have it on good authority that these cows live a very happy life, whereas the grocery store ricotta cows most likely do not. Somewhere in between is organic ricotta — it’s possible that the cows are treated humanely but I really can’t be certain. And I’m not comfortable with that. Plus, ricotta is a snap. Bittman assures us that making fresh cheese is almost as easy as boiling milk, but I’d go one step further: making ricotta is as easy as boiling milk. Seriously. You boil milk, dump in some buttermilk, and then pour it all through a strainer lined with cheesecloth. The hardest part is finding the cheesecloth. Unless, you know, you live in some place that has real stores. And in addition to the feeling of accomplishment, fresh ricotta tastes way better than anything you can buy at the store. I think I boiled mine too long and drained it too much and still it was yummier than any ricotta I’d previously encountered. And did I mention it cost half as much to make it as to buy it? 1) Line a strainer with three layers of cheesecloth and place over a large heat-proof bowl. 2) Pour the milk into a large pot and heat over medium-high heat, stirring frequently so that the milk doesn’t scorch. Continue stirring until the milk begins to bubble, about 10-15 minutes. 3) Add the buttermilk to the boiling milk all at once and stir constantly until the mixture separates into curds and whey. This will look like egg whites suspended in a yellowish liquid. (this happened pretty much immediately for me) Remove from the heat; stir in a large pinch of salt and a squeeze of lemon juice. 4) Carefully pour the mixture into the cheesecloth-lined strainer and let it drain for 15-30 minutes until it reaches the desired consistency. 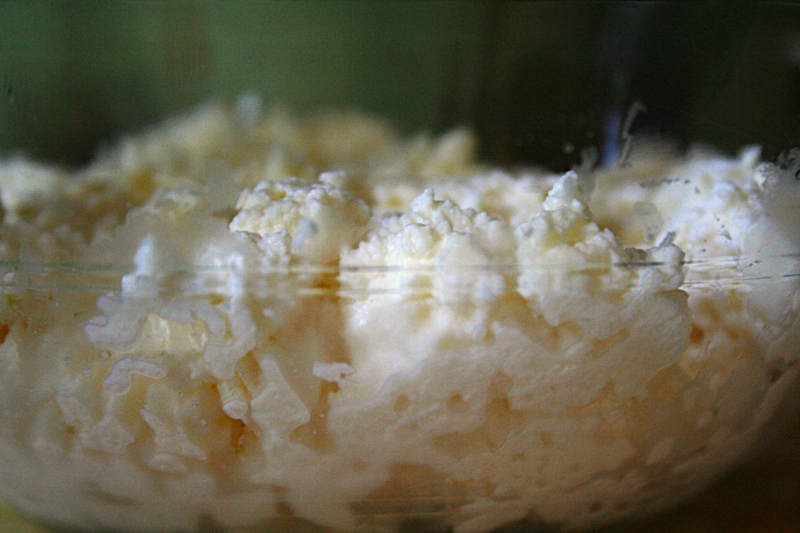 5) Scoop the ricotta into a container and store it in the refrigerator. You’re supposed to discard the whey, but I just can’t bring myself to do that. Apparently you can use it as the liquid in any recipe that calls for one (rice, soup, bread. . .even lemonade) or water your plants with it or, if all else fails, dump it on your compost pile. This entry was posted on July 26, 2008 by Megan @ When Harry Met Salad. It was filed under eggs, dairy, & cheese and was tagged with ricotta. this is my new favorite blog….. In two weeks my bride and I are going to visit an organic farm just north of here and take a one day class on deciding if you’re suited for small farming. They also run classes on topics like bee keeping and cheesemaking. Don’t joke about going from cheesemaking to wanting to raise a goat or two. I think we’re heading in that direction ourselves. And that cheese looks delicious. Get a Nigerian Pygmy goat. They’re supposed to be prolific milk producers. I hate you. 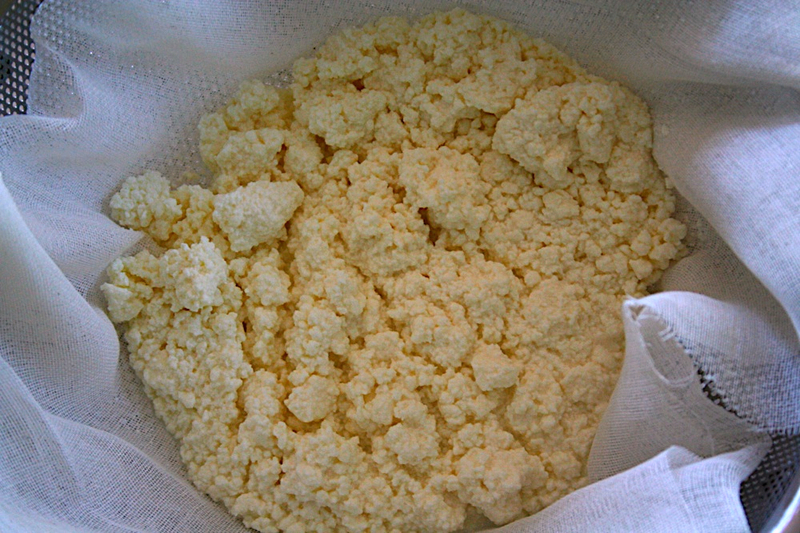 My cheese making experience is a freaking disaster, and you’re all “la la la, look at my perfect ricotta.” bite me. Oh, the cheese book suggests using the whey in bread dough for one, and mixed with koolaid for another. I want a goat so bad. I love goats. I used to milk them and care for them at the Lincoln Park Farm in the Zoo when I was a volunteer. They are so smart, and playful, and funny. It was hilarious when they would trick a schoolkid and eat his lunch! Goat milk is much easier to digest too, because the goat is closer in size to a human, and thus the milk has fat globuals that are smaller. But seriously, though, Megan, this is weird because I made homemade cheese curds this weekend. I cooked my milk with a garlic clove, and threw in some finely chopped basil at the last second. Now it is in the fridge being pressed with a weight to see if I can get it to congeal into one piece of cheese. The recipe I have did not call for buttermilk, though, so maybe I should try yours as well. Thank you. You have just inspired my project for the day. Looking forward to seeing what else you come up with. Megan, btw, I pressed my curds and I got a solid piece of cheese! Cool! I left it in the cheesecloth, and put it in a small bowl, and then on top I put a jar filled with water (for weight) that fit snugly inside the bowl. I emptied some residual whey out of the bowl a couple of times over the next 24 hours. The next day, solid cheese! I have yet to see an egg, but I love, love, love my chickens! NOTHING goes to waste! They eat all the scraps from the kitchen. My niece gave me roses and when they wilted I gave them to the chickens! If a veggie gets too old (I mean really, really bad…) it goes to the chickens. It’s great!!! I might have to think about a goat. I love goat cheese! Get some chickens!! You will love it. I’ll post about the chickens real soon. You do have a lot of time on your hands. Know what I did this week? Thawed out chicken. I didn’t have time to cook it or anything, but the thought was there. Your blog is beautiful. Where are those photo cards I’m supposed to be selling in my store? I’ll sell food photos, they’re so pretty!!! Ok so when are you coming back to cook for me! Yes I am self centered and am leaving Rob out. Your page looks awesome. Glad to see you’re blogging again. Pretty! Vikki – How ’bout if you work on Chris for a while? Let’s start with chickens and work our way up to goats. I definitely need to try my hand at actual cheese now, especially since you’ve done the preliminary testing and gotten such good results. Sister Joyous Whip of Enlightenment – Thanks for the visit! Bubbles – Coordinate your efforts with Vikki. Meaghan – I guess we’ll shoot for next year on the cards? This time I mean it. Jess – How ‘boout a pre or post Thanksgiving potluck? Where can you get cheesecloth – not those tiny Sunbeam packs for $4.99? Susan – I live in a fairly rural area and small packets of cheesecloth are available in my grocery. I’ve also seen them at Bed Bath & Beyond. I’d think that in NYC you could get cheesecloth just about anywhere. 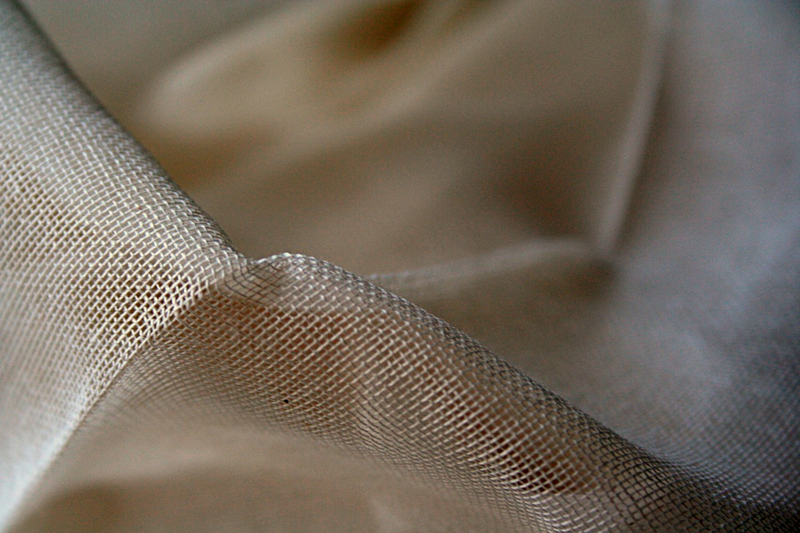 However, unbleached muslin, available at any old fabric store, is a good and inexpensive alternative. Thanks for the visit!